We are manufacturer and exporter of ECG rolls in different required sizes. 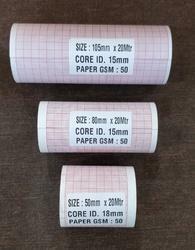 Available with us is a comprehensive range of ECG Rolls, which is offered by us in various sizes and thickness of 60GSM/80GSM. Owing to their high tear strength, smooth texture and optimum resistance to water, these are extensively used in hospitals, pharmaceutical industries and ATH labs. Moreover, we offer these at the most competitive rates. 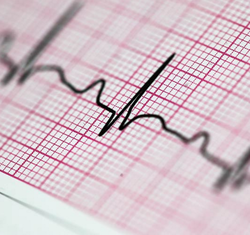 A comprehensive range of ECG Rolls is offered to our esteemed clients. This range is available in precise sizes and thickness. Moreover, our range is widely used in hospitals, pharmaceutical industries and ATH labs. Fine texture, wear and tear resistance and water proof are the key features owing to which this product is highly praised by the clients. Additionally, these products are available in the market at reasonable prices. We are placed among the renowned firms, engaged in offering quality assured array of ECG Recorded Chart Paper Roll. Widely used in pharmaceutical, petrochemical and other industries, these charts are crafted by our skilled vendors using ultra-modern technology in adherence to international parameters. In order to provide defect-free assortment at clients' end, these are quality checked on various parameters set by the industry. Besides, clients can avail these charts from us at market-leading prices. 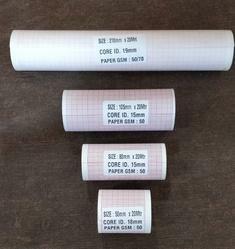 Looking for ECG Paper Rolls ?